In the midst of great public furore incited by Seymour Hersch's article that revealed how traitors in Pakistan's military leadership actively assisted America in her May 2011 attack on the key Pakistani military town of Abbotabad, Washington decided upon a timely release of documents that it alleged were recovered from the Osama bin Laden's Abbotabad compound. This release only further exposes the treachery of those in Pakistan's leadership who continue to ally with America in its war against Islam today. 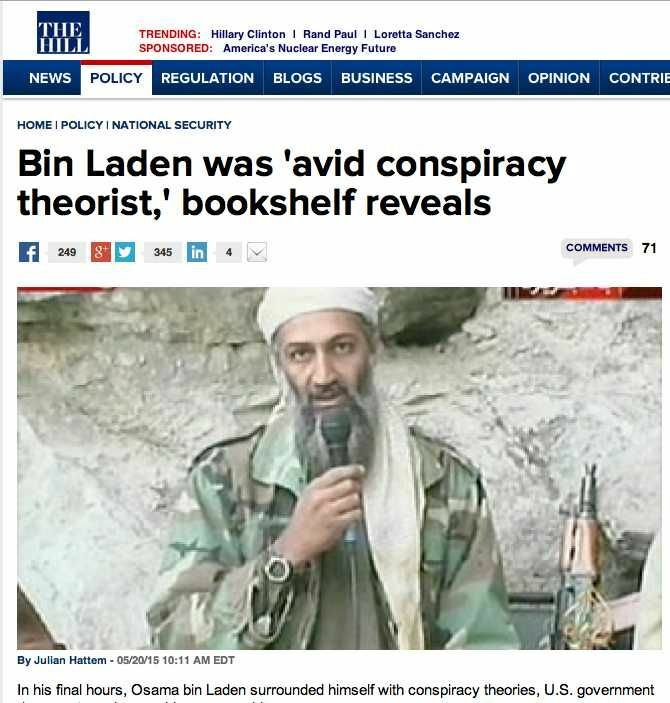 The list of documents released on 20 May 2015 by America's Office of Director of National Intelligence (ODNI), under the title of "Bin Laden's Bookshelf," has a section entitled "Material Published by Violent Extremists and Terror Groups." Within it, the US agency mentions titles from a certain “Khalifah Publications,” which include books issued by Hizb ut-Tahrir. Closer examination reveals the wicked American agenda against Islam and its political expression. The alleged library includes the “Communique of Hizb ut-Tahrir to Colonel Ghaddafi (1978),” which establishes clearly from the Quran and Sunnah that the Sunnah of RasulAllah (saaw) is an integral part of Islam. The library also includes the book "Thinking," in which Hizb ut-Tahrir presents Islam's view towards material sciences and how to optimize thinking over literary, legislative, intellectual and political texts. It also includes Hizb ut-Tahrir's book "The Turbulence of Stock Markets, Their Causes and Sharia Rule Pertaining," which exposes the volatility of the capitalist ideology and its failure to secure the economic rights of people, whilst presenting Islam as a practical alternative. And it includes "A Warm Call from Hizb ut-Tahrir to the Muslims" which gives evidences from the Quran and Sunnah for numerous Islamic rulings, including the obligation of accounting the ruler, the obligation of Jihad and the prohibition of Riba. So, apparently, America asserts that adhering to the Sunnah, optimizing Muslim thinking, seeking Islam's economic solutions and clarifying Islamic rulings are all "violent extremism" and "terrorism"! And what of America's sacred "Freedom of Expression"? Is such “Freedom” only for those who viciously defame Islam and not for those who seek to advocate Islam, with competence and awareness? Yet, in blind obedience to Washington, the Raheel-Nawaz regime has denounced the literature of Hizb ut-Tahrir as "hate material,” in its numerous court cases against the shebaab of Hizb ut-Tahrir in Pakistan. By doing so, the Raheel-Nawaz regime is exposing and undermining itself, in a land where Muslims have a deep attachment to Islam, which was developed over centuries of adherence to Islam, fighting in its cause and ruling by it. The regime's National Action Plan is fundamentally flawed because its architect, America, does not understand the reality of Muslims, a defiant people who never yield before tyranny, rather their Imaan compels them to rise up and end it. That is why whenever the kuffar have tried to forcefully suppress Hizb ut-Tahrir through their agents in the Muslim World, the oppression has only succeeded in increasing the Hizb's credibility and popularity in the society, including amongst those who will give the Nussrah for the establishment of the Khilafah, the armed forces. Pakistan today is no exception. The Muslims of Pakistan on the one hand are seeing that the regime has adopted force, because it is intellectually bankrupt and unable to refute the strong case Hizb ut-Tahrir presents for the return of the Khilafah. Whilst on the other hand the Muslims see the shebaab of Hizb ut-Tahrir striving for the truth, despite intense oppression, increasing the anger of the people against the regime for its unjust tyranny. Without doubt, by pursuing the American policy of the forceful suppression of Islam, the traitors in Pakistan's leadership are hastening the collapse of the regime. Blinded by arrogance, the clumsy, brutish, “cowboy” America cannot save them from being uprooted and being replaced by a sincere leadership ruling by Islam. Rather America will demand from the traitors continuously, whipping and herding them along into destruction, without shedding a single tear for them, for America's loyalty and friendship is only for her interests, and not for the fools who ally with Washington in achieving those interests. As for the Ummah, she will shed no tears for the foolish thugs who stood in her way as she rose up for Islam, trying to beat her back to sleep, at a time when she was bleeding from many wounds inflicted by her enemies. "اور وہ لوگ بہت سے باغ اور چشمے چھوڑ گئے اور کھیتیاں اور نفیس مکان، آرام کی چیزیں جن میں عیش کیا کرتے تھے۔ اسی طرح (ہوا) اور ہم نے دوسرے لوگوں کو ان کا مالک بنا دیا، پھر ان پر نہ تو آسمان اور زمین کو رونا آیا اور نہ ہی ان کو مہلت ہی دی گئی"